Having trouble opening your tubes? NEB Tube Opener can help! High efficiency chemically competent E. coli cells suitable for T7 expression with enhanced reduction of basal expression. Enhanced BL21 derivative, chemically competent E. coli cells suitable for high efficiency transformation and protein expression. A T7 expression plasmid and the same plasmid containing a gene encoding a toxic mammalian protein were transformed into each host. Comparison of the relative transformation efficiencies demonstrates that the T7 Express hosts provide the levels of control necessary for transformation of potentially toxic clones. BL21(DE3) could not be transformed with the toxic clone. A T7 expression plasmid containing a gene encoding an E. coli protein was transformed into each host, grown to 0.6 OD and induced for 3 hours. Comparison of soluble extracts from uninduced (-) and induced (+) cells shows superior control of basal expression in the T7 Express hosts while maintaining high levels of induced expression. 50 μl of competent cells were transformed with 100 pg of pUC19 control DNA following the provided High Efficiency Transformation Protocol except heat shock time varied from 0 to 80 seconds. 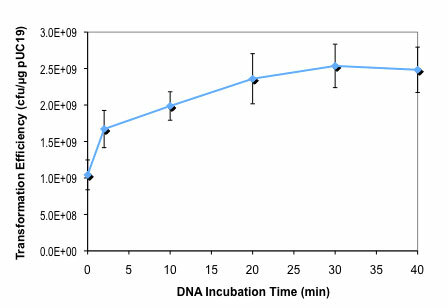 50 μl of competent cells were transformed with 100 pg of pUC19 control DNA following the provided High Efficiency Transformation Protocol except DNA incubation time varied from 0 to 40 minutes. Maintenance of the miniF plasmid does not require antibiotic selection. If chloramphenicol is added, use 10 µg/ml final concentration. Why are there no colonies or no growth in liquid culture (C3010)? Why is there no protein visible on gel or no activity (C3010)? Why is induced protein insoluble (C3010)? What are the solutions/recipes (C3010)? What are the strain properties (C3010)? What is the difference between NEB #C3010H and NEB #C3010I? What is the optimal heat shock time for this strain (NEB #C3010H and NEB #C3010I)? How long should I incubate cells on ice after DNA has been added (NEB #C3010H and NEB #C3010I)? Is T7 Express lysY (NEB #C3010H and NEB #C3010I) compatible with auto-induction procedures? What s the shelf life for this strain (NEB #C3010H and NEB #C3010I)? Are NEB's competent cells compatible with the “Mix & Go" protocol? Is antibiotic selection necessary to maintain the MiniF-lysY plasmid? Is T7 expression subject to catabolite repression in NEB T7 Express or SHuffle strains?